One of the minor myths of the history of the T-34 was given out about 20 years ago in a biography of Alexander Morozov, one of the three designers credited with the design of the T-34 tank. When the Kharkov Locomotive Factory No. 183 (the factory building the T-34) was evacuated to Nizhniy Tagil in October 1941, the rolling machines used to bent the plates for the cast turret did not arrive on the other end due to a problem with rail shipment Morozov supposedly quickly designed a cast turret which was the equal of the rolled plate welded one and got it into production in a matter of weeks, thus saving the T-34 and the Soviet Union, etc. etc. Not quite. The truth is that from the very beginning both cast and rolled turrets were made for the T-34 tank, and were fitted as available. The main reason for that is research into cast versus rolled plate turrets showed that castings had to be 15% thicker than homogenous armor plate to give the same penetration resistance. The plates on the welded plate turret were 45mm thick; the cast turret was 52mm thick. The origins of the myth seem to have been why after the factory moved only cast turrets were produced, but the real reason is they are faster to make and cheaper. For years the only kit of a cast turret T-34 was the ancient one from Tamiya, which, while the turret was not bad, sat on a very poor hull and thus took an incredible amount of work to correct. Having done a conversion of that kit to an accurate cast turret Model 1941. using a Zvedza hull, the Tamiya turret, Maquette tracks, and a lot of conversion work it is not a fun change to make, and even swapping that turret to a DML Model 1941 hull is more work than one would think. Happily DML now offers a complete kit, which also includes the complete external parts of the Model 1941 cast turret as well. The new kit uses many of the "tweaked" sprues that were used in the cyber-hobby.com STZ-built T-34 Model 1941. Nothing wrong there – the earlier kit was a bit of a disappointment as it only made the original version of the STZ tank, which was virtually identical to the Factory No. 183 version in many respects (the first 50 in fact being "knocked down" 183 hulls and turrets.) It builds us as a basic model T-34 Model 1941 but with some odd choices of accessories. First off, it has "sprue" tracks of one of the earlier T-34 track designs with cast bars for reinforcement and a smooth face. This track was used on T-34 Model 1941s to be sure (the track is on the Aberdeen Model 1941 as a point of reference) but was quickly dropped for the later track type – the so-called "waffle" patterns. 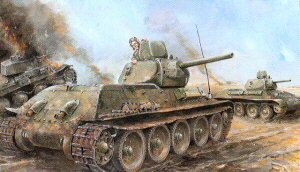 Secondly, it comes with both the 40 liter "box" tanks and the 95 liter round auxiliary fuel tanks, which did not come into service with the T-34 until much later – after the 40 liter "box" tanks were dropped, they went to the rear mounted angular tanks, and only in 1943 did they switch to three of the 95 liter tanks. It's too bad DML does not the angular set with this model, or a set of waffle tracks, as that would provide the builder with a wide variety of versions to build. While this tank was replaced in production at Nizhniy Tagil in April 1942 by the "Gayka" hexagonal turret, many of the other factories used this design or a very similar one until mid 1943. The kit is basically a straight-up early model T-34 with rounded nose hull, "vertical" slat air intake grilles, rectangular hatch rear plate, and pressed steel wheels with rubber tires with lightening holes around the rim. Note that while the box digital art shows an early model T-34 hull pan, it is the same one with double stops on the front road wheel mount. The new turret is a beautiful job of "slide molding" with a nearly flat base and the rest of the detail cast in place. A new 76mm gun barrel is provided, one piece with "slide molded" hollow bore. The hatch is the later one with the original openings for flags and signal lights and rotating periscope removed from the molds. The model does have a large fret of etched brass, and as with most DML kits you have your options on using it or not at your election. Alas, the directions are the "color photo" type which makes assembly much more difficult. At least DML has finally figured out this doesn't help with etched brass, and now they do at least provide foolscap sketches with each one showing where the etched brass pieces go if you choose to use them. The model comes with five finishing options: Unidentified unit, Eastern Front 1943 (whitewash, "Za Leningrad!" in red); Unidentified unit, Eastern Front 1943 (4BO green, "white 64"); 116th Tank Brigade, Eastern Front 1942 (4BO green, white 2-045 "Parkhomenko"); Unidentified unit, Manchuria 1945 (4BO green, "BARS" in white); Unidentified unit, German Army, Eastern Front 1942 (grey, yellow "1053"). I must say that I am always puzzled when there are a great number of good choices for markings and one is wasted on a "captured" vehicle. Also, something does not read right with the Cyrillic for the "Za Leningrad!" tank; I think it was supposed to say something like "from the womens' work brigade in honor of Welder Seorshin" but what is there does not make much sense. Decals as usual are from Cartograf.